I am so glad that our girls have each other. I don't have a sister and I've always been a bit wistful when I look at sisters and the bond they have... Yes, I have my mom, my aunts, very good friends and now my daughters, but the bonds that sisters have is really something special. 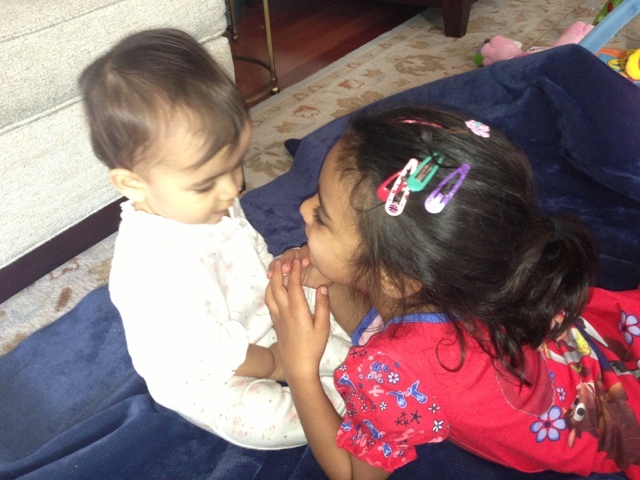 In the years to come, I expect my girls to be best friends, playmates and confidantes. They've started already... Anjali breaks into smiles and giggles when she sees Cassia every morning or when we pick her up from preschool. Cassia loves her sister so much and uses a baby voice when speaking to her but doesn't pay too much attention to her... this morning though, as they were playing with each other, C turned to me and said "Mommy, this is who I want to marry."